The Five Finger Rule and Why it is Bad for Boys. The Five Finger Rule is Harmful to Boys’ Reading. There I said it. I have read all of the reasons that people think it is so great but I think it is not only awful but also harmful. The “five finger rule” for just right books, also called “5 finger tips”, is all over the Internet, taught in schools, and has even invaded libraries. I was at a library recently and saw a poster on the end of the stacks with the 5 finger rule featured. I could not be more upset that this rule is so prevalent. I know it is popular, and I know many people will disagree with me, but the five finger rule is bad for boys. We write a lot about boys learning because the whole goal of this site is to help you raise boys who love to learn. Part of loving to learn surrounds reading and that is why we focus on how to get them reading. Be sure to see the 5 ways you can help your boys with reading at the end of this article. They are easy and they work. Open your book to any page. Read the words on that page. When you come to a word you do not know put up a finger. Now use the number of fingers to help you decide if this is a good book for you to read. 1 finger up: too easy. 2 fingers up: a good choice/a “just right” book. 3 fingers up: you may need help reading this. 4 fingers up: hard to read. 5 fingers up: choose a different book/put it back. There are variations on exactly what each finger means but they all have basically the same meaning. The child is taught that he should choose books based on the number of fingers he puts up. There is so much wrong with this that I hardly know where to begin. There is a lot of emphasis on reading levels and testing boys to see what level they read at. Once these levels are determined boys are encouraged to read books that correlate to their reading level. The five finger rule fits in with this emphasis on reading levels. Educators miss an important point here. It is not what level boys are reading at or that a boy needs a “just right book” that is the issue. It is simply that boys read. The more they read the better they get at reading. The more they read, the more they learn. 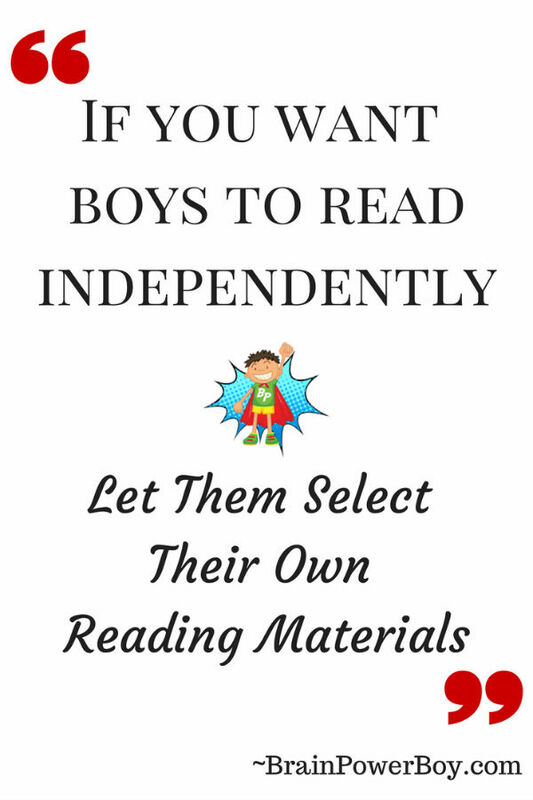 When it comes to boys and reading there are so many people and educators concerned that boys are not reading enough that it is really hard for me to believe that something as limiting as this silly rule is being taught in schools and being promoted in libraries, but sadly it is. If boys are not reading enough why in the world would you limit in any way their book selections? The apparent theory is that they will get too frustrated if they don’t know the words in a book and then they won’t read at all or will start to hate reading. These theories would not be at all true if you let them choose items to read that they actually find interesting—and that includes anything that they want to read not only books. Boys like to read books but they also like to read manuals, comics, graphic novels, magazines, almanacs, non-fiction, websites and more. Boys like to read things that are interesting to them. Who doesn’t? Interest-led learning is very natural and who knows how much they will learn just by picking up reading materials on topics they actually want to know about. Can a Book be too easy? The answer is No! There are big benefits for boys who read easy books. They are reading and developing a habit of reading for enjoyment. They are finding out things they want to know about. Easy to read books allow a boy to explore many different subjects. In exploring many different subjects they are being exposed to a variety of words which can lead to an expanded vocabulary. Becoming proficient in reading common words helps boys to read faster. They feel comfortable reading words they are familiar with while still being exposed to new words. It is easier to figure out new words if you know the words surrounding them. They can find out what the new word means within the context of a sentence they already understand. Boys read many more books when they know they have the ability to read them. Pressure does not help boys to feel comfortable with reading and may lead to a dislike of reading. Easy books let boys see and remember how words look. This may lead to boys being able to remember how these words are spelled. he problem comes in that someone else really chose what just right was. An adult, told the boy that if two fingers are up that book is good for you to take and read. I’m sure boys would choose some of these books if left to their own devices. Boys would choose a variety of books, some hard, some easy and some that fit these guidelines. The other issue with the five finger rule is that you select a random page. What if on that random page the book was deemed just right but the rest of the books was super easy or very difficult to read—kind of throws the whole thing off doesn’t it? Boys who don’t enjoy being told what to do or what to read will be put off by “just right” books and this method. Finally, saying that a book is “just right” is subjective at best. So what? Putting it this way makes it seem like that is an issue, a problem or a bad thing. Yes, I know these “rules” are for independent reading but I think this label is a poor choice because talking with others about books or words is fun, interesting, worthwhile, enjoyable and a great learning experience. So . . . once again, I find fault with these rules. Why make it sound like needing help is a negative thing. If you tell some boys a book is tough to read they are not going to look forward to the experience. Just calling it hard to read is an issue. I’m sure that boys, especially those who don’t really enjoy reading books, are put off by such statements. There are other boys who would be challenged by this statement—good for them 🙂 but still, why label a book this way at all. Saying a book is hard to read pops a label on the book and this is just not necessary. Many boys don’t enjoy children’s books at all and would prefer to read books from the adult section. Sure some of the words are harder but they are more detailed and many boys crave details. Yikes, I’m pretty sure this is the one I dislike the most. Choose a different book. Put it back. So . . . a boy goes to the shelf, looks around, picks up a few books, puts some back and finally decides that he likes a particular book. Then he has to open it up to a random page and perform the “test.” He finds that there are 5 words he doesn’t know on the page and he has to put the book back. That is awful! He picked the book. He wanted the book. He was likely going to read a bit of the book or maybe he was going to read the whole thing. Think about it, if you tell a boy a book is too hard you may well end up being correct. He will likely always think it is too hard or have a negative feeling about that title. He may also be hearing “you are not smart enough to read this book.” How terrible. There are many reasons a boy should be able to choose a hard book. He may be able to figure out new words by looking through the book. If he wants to ask someone what the words mean he can do so. Boys can get someone to read the book with them or to them. They can skip over the words they don’t know and still learn something from reading the book. Letting a boy choose a book that is “too hard” is being respectful of his decision. Decision making is an important skill and you undermine his confidence by interfering with his choice. You just limited the books available for a boy to choose from. I thought we were trying to get boys to read, not limit their choices. Did I say that already? Well, it bears repeating. The whole idea is condescending. Surely a boy has the ability to pick out a book that he will enjoy reading no matter his age or reading level. Some boys would find reading books at their own level to be boring. For another article on why the 5 finger rule isn’t good for kids see: Why I’m Not Sold on the Five Finger Rule. If your boy has already been taught the five finger rule, just tell him to stop using it. There is no reason to limit his choices in this way and frankly you will be doing more harm than good by using it. Here are some things you can do instead. Let him choose his own books. Think reading materials, not just books. Books are not the only things boys like to read. That is it. 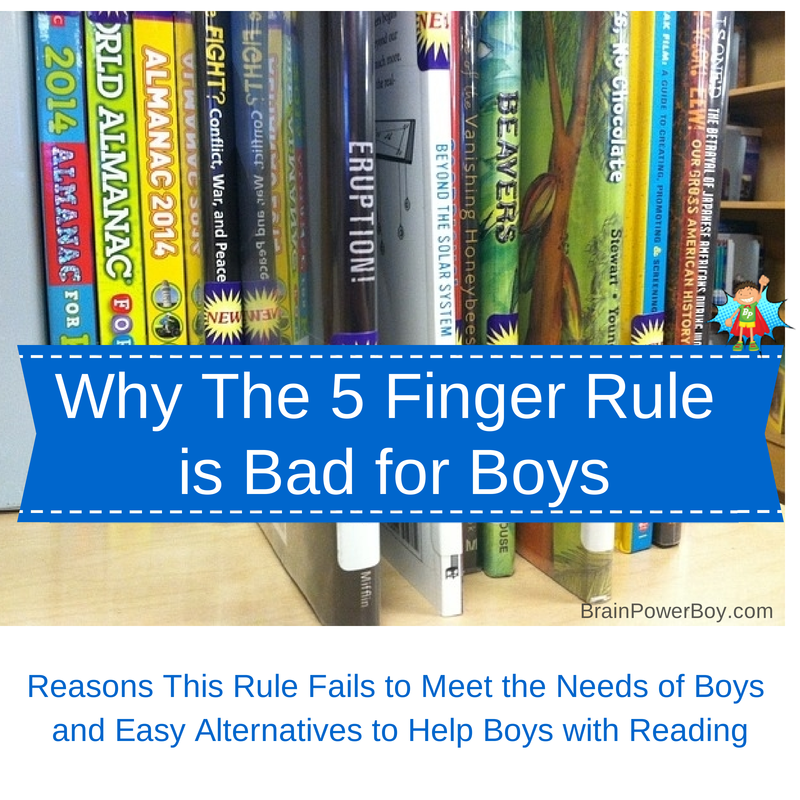 5 easy things that you can do instead of the five finger rule to help boys with reading. It is really very simple. Raising a boy who likes to read for pleasure and/or information does not require odd little rules. It just requires being open to what a boy would like to read and reading together often. If you want more information on boys reading like Why the 5-Finger Rule is Bad for Boys you can also try 10 Reasons Not to Limit Your Boys Reading Choices and What to do if Your Boy Hates Reading. What are other great ways to encourage our boys to read in a natural way? I would love to hear your thoughts. I read this as I was going down the 5 finger route,however I have pulled the breaks on – a bit-Can it be modified? Can it be positively worded? etc. This is just off the top of my head. but can the guide be helpfully ‘spun’ so that they are not frustrated by picking up books/materials that they can’t decode and understand.that too is equally undermining. Yes, i know the site focuses on boys, but many girls have these issues. Maybe thinking about all readers would enable the errors in the 5 finger rule to be addressed and modified. What do you think. Thank you for questioning it- I am now looking to modify- I still need something to use to help support 20+ children in a <40 min lesson. They need some method when choosing independently, this seems like a scaffold to enhance and give the children some parameters. Thank you for taking the time to comment. I am happy to hear you have put the brakes on using the 5 finger rule. I understand your interest in modifying the rules and asking if they could be written in a more positive manner. I suppose they could. I, however, will not be the one to do so. In my article I explain why arbitrary reading “rules” are harmful. I do not agree that picking up a book that they cannot yet read is undermining their abilities. In that case, they need help in getting the information they want out of the book. Maybe, all they want to do is look at the pictures. Or, maybe, they would like someone to read it to them. Stopping them from picking up a book that they cannot yet read does not help them on their reading journey. Think of all they could learn by being exposed to that book that they pulled off the shelf and want to look at. They are interested! Interest-led learning is incredible. Girls do have this issue as well. The 5 Finger Rule is a problem for all children. I really do appreciate you reaching out about modifying the rule. My best advice is to think about this: we do not need any rule to help them find books. Let them choose the books that they want to take off the shelves. Let them be excited about making their own choices. Then help them with the books they found.